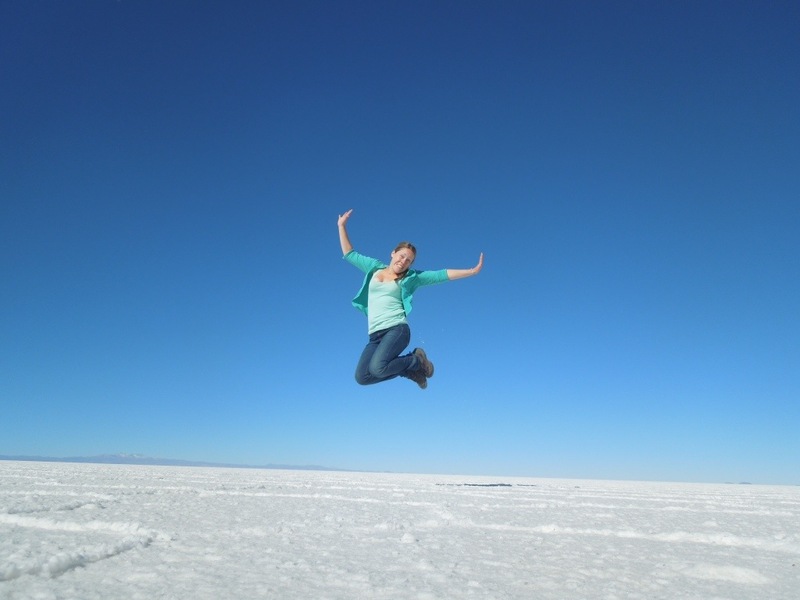 When I had heard about the tours of the Salar de Uyuni, I had only been told, and seen pictures, of the salt flats themselves. But although these are arguably the highlight of the three-day tour, they actually only make up a small part of what you see. Day one and we drove off in our jeep to the train cemetery just outside of town. 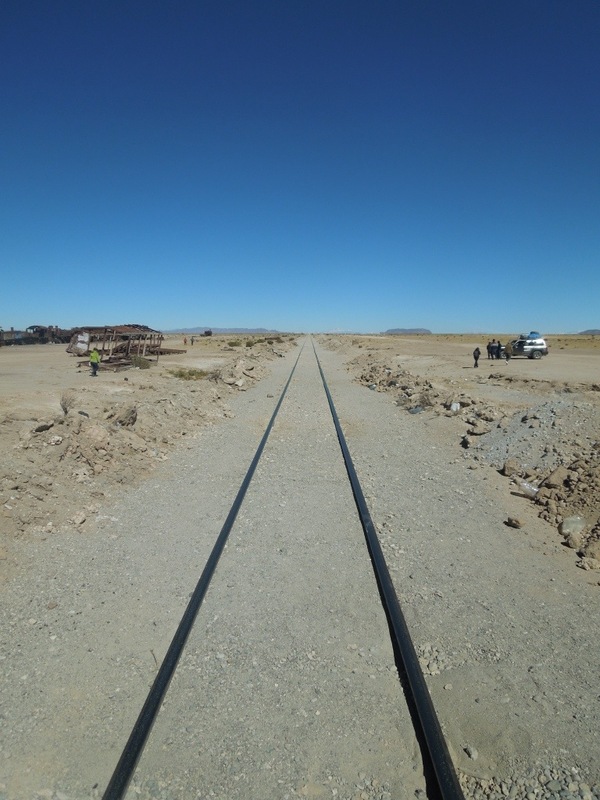 Towards the end of the 19th century, Uyuni became a transportation hub for the mineral trains going to the ports. We were told that the trains came from Britain (along with a second import from this great kingdom, football), and the engineers who built the tracks were certainly British. 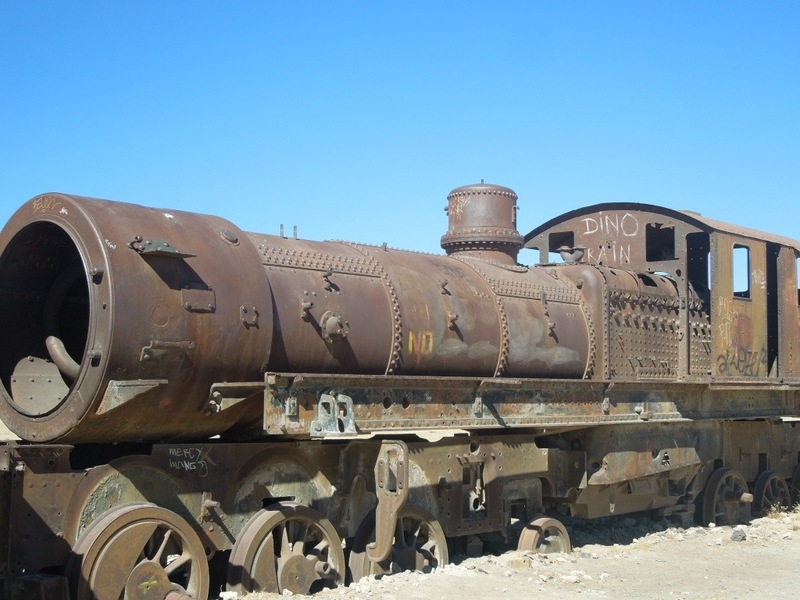 By the 1940s, however, the mining industry had collapsed, and many trains were abandoned. 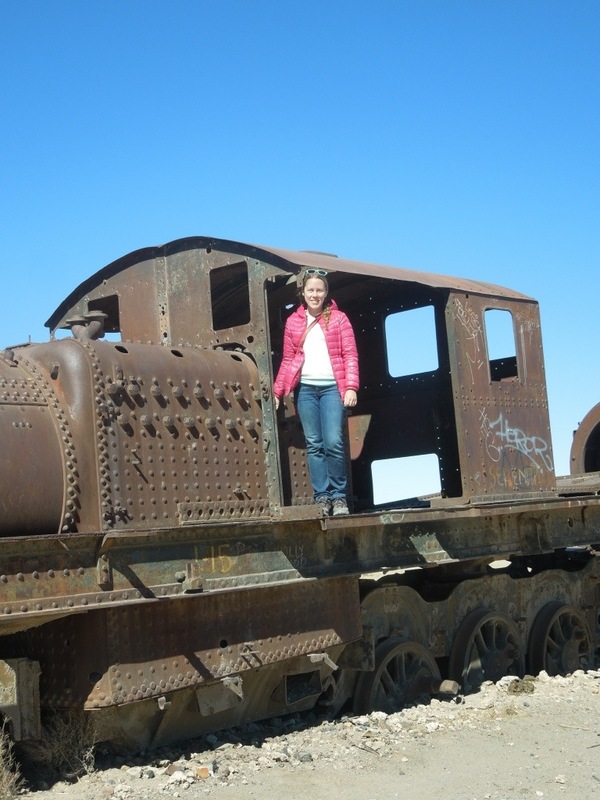 Now the rusty old trains serve as a popular, if unusual, tourist attraction. 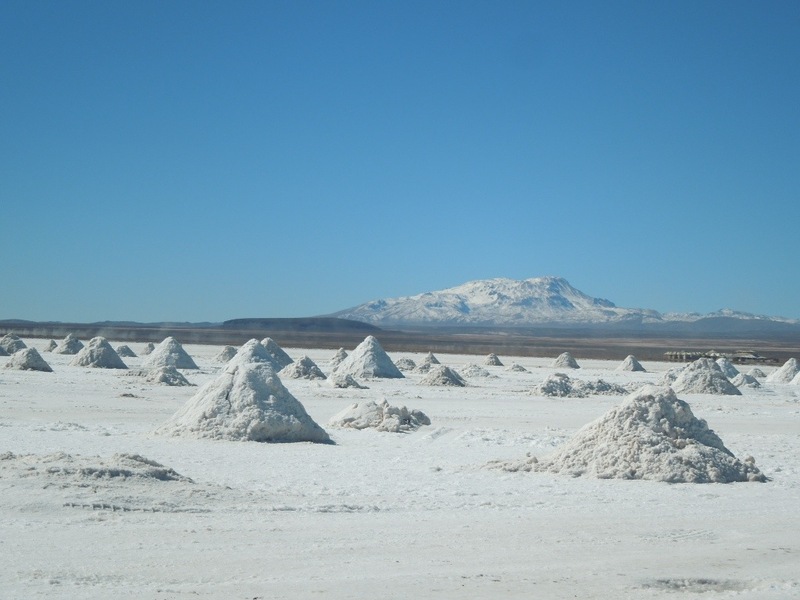 Then the salt tour started in earnest: we went to a salt museum which consisted solely of salt statues of animals (you had to pay for the privilege of taking photos of these works of art), artisan stalls where you could buy various little objects made of salt, and the salt factory where we were taken through the process of heating and drying the salt to make a sellable product. You could also buy salt but it looked dangerously like cocaine so I didn’t think it was such a good idea. 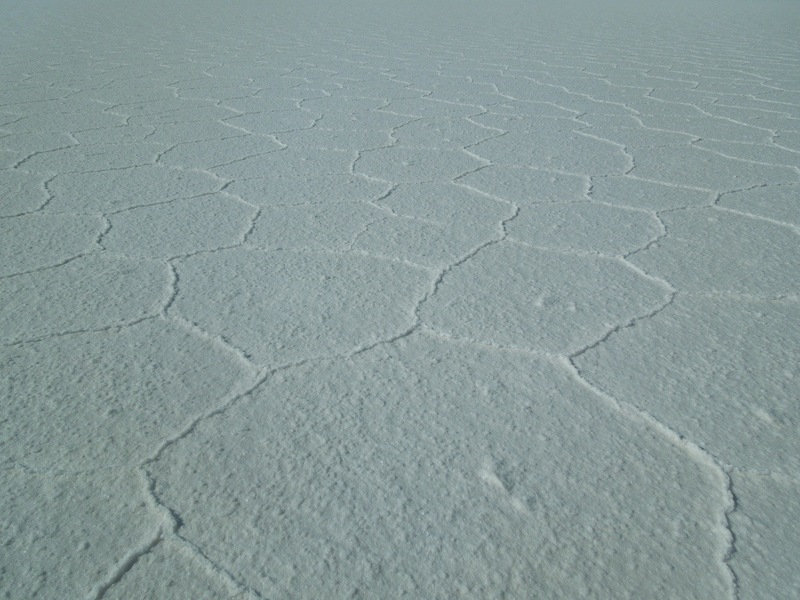 According to Wikipedia, the Salar de Uyuni contain as much as ten billion tonnes of salt, of which only 25,000 tonnes are extracted each year; and the salt is constantly being replenished, as it rains and the water evaporates in an endless cycle. We had lunch (cold lama meet with cold cheese sauce, cold quinoa and cold fries; but warm apple pie, yum!) 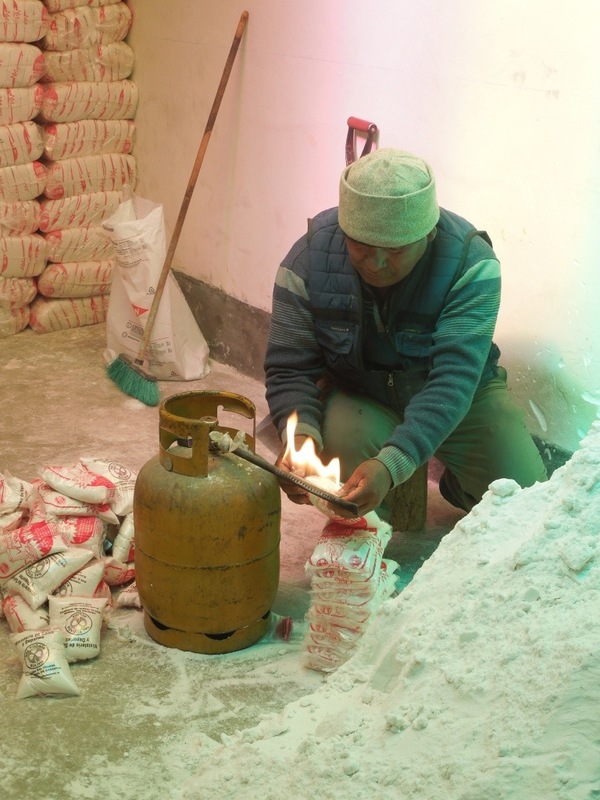 in a salt hotel, with the tables and chairs, and in fact the whole building, made out of salt. Can you be allergic to salt? I don’t think so but if you are, don’t come on this tour. 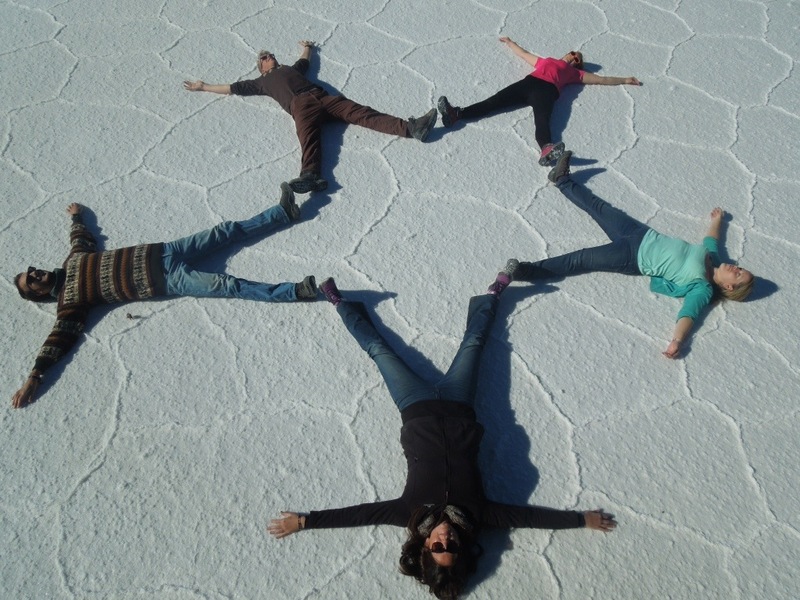 The most famous images of the Salar come from the middle of the salt flats, where the salt is more than 100 metres deep. In the rainy season, the ground is transformed into a perfect mirror with heaven and earth blending together in one huge canvas. 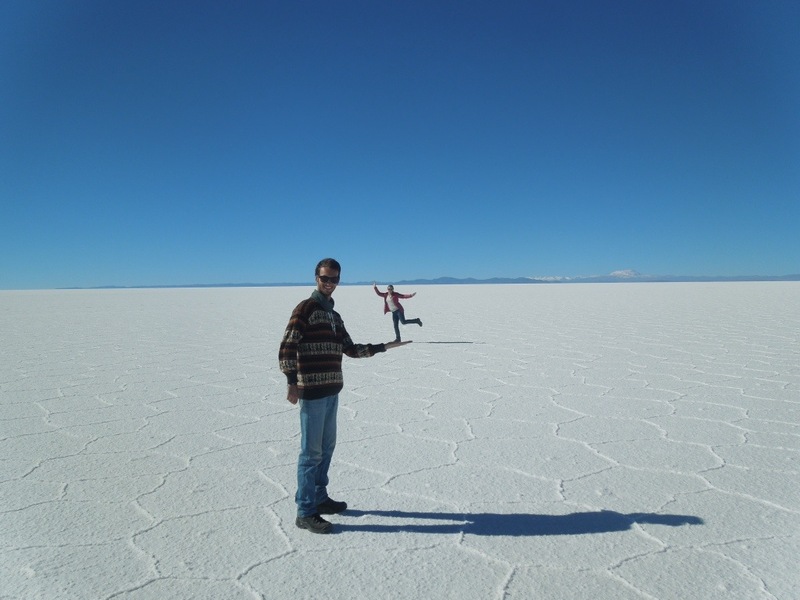 In the dry season, as when I visited in June, the game is to play with the perspective in an optical illusion of endless white. 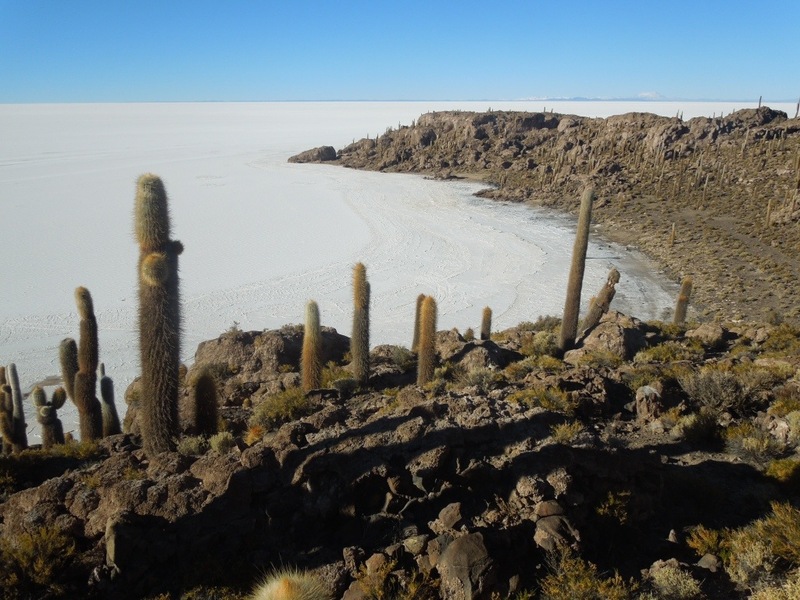 When we’d finished playing, we continued on to Incahuasi, an ‘island’ on the salt flats with giant cacti. 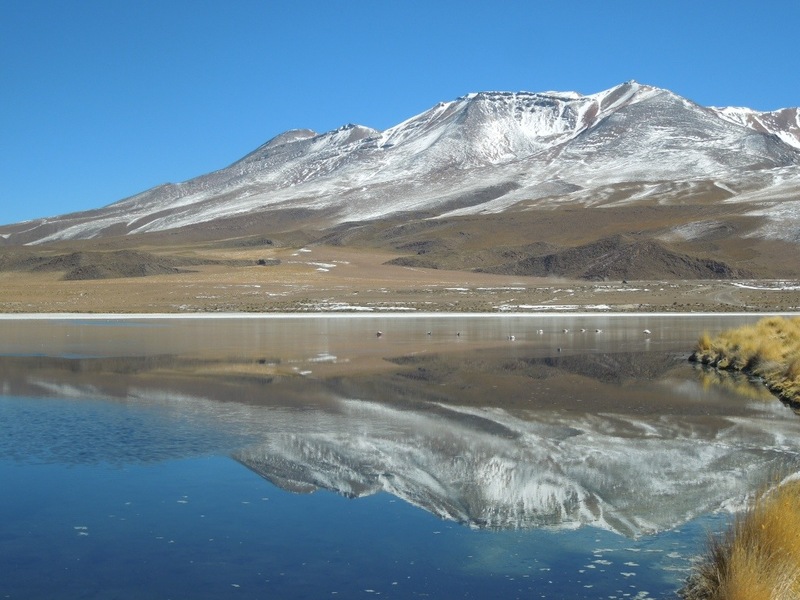 From the island, you can see three big mountains, about which Aymara legend tells of a classic tale of affairs and deceit. The giant mountain Tunupa married Kusku, but soon ran off with the third mountain Kusina. Tunupa, devastated, cried as she breastfed her son. 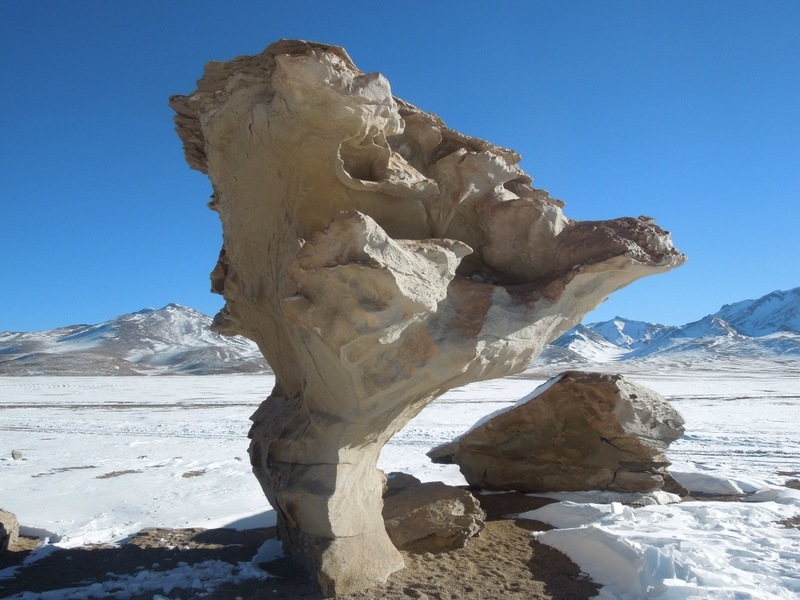 Her tears and milk blended together to form the Salar; among the Aymara, therefore, their correct name is Salar de Tunupa. 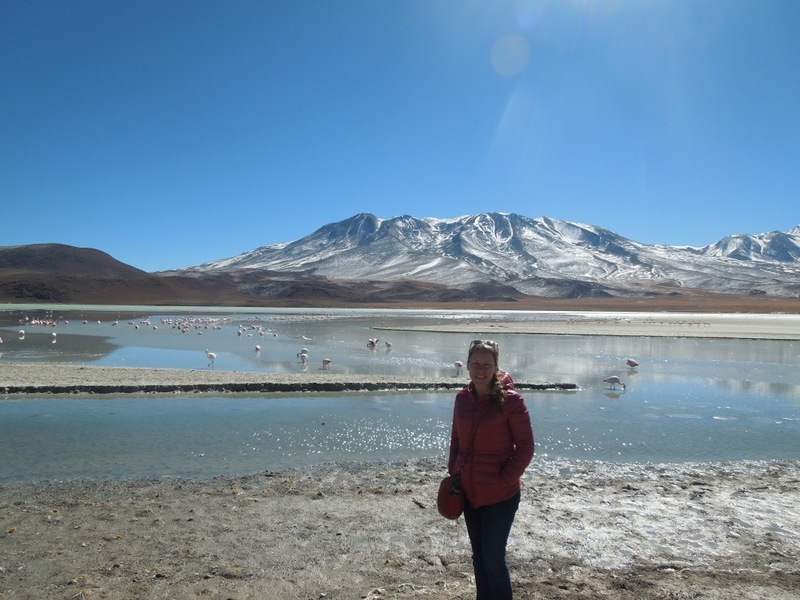 After spending a chilly night in another salt hotel (these have sprouted up in response to tourist demand), we left the world of salt and headed into a different landscape with volcanoes and lakes populated by different species of flamingos, as well as a very exciting tree of stone. The music taste of our driver and English-speaking guide left a lot to be desired but at one point we did let ourselves get swept up in a roaring rendition of YMCA and another of Wake me up before you go go. We had a great group: I was joined by a tall and talkative Australian girl, a not-so-talkative Dutch guy, and ‘the kids’ as we called them, a young English guy and his Slovakian girlfriend who we put in the back of the car (they had seats, we didn’t put them in the boot, I promise). (We also met a funny English guy who was very particular about how he wanted to take his photos; he was going to teach us kackerlacka-poker but sadly we didn’t see him again – so if anyone knows how this apparently fabulous game is played, please let me know!) 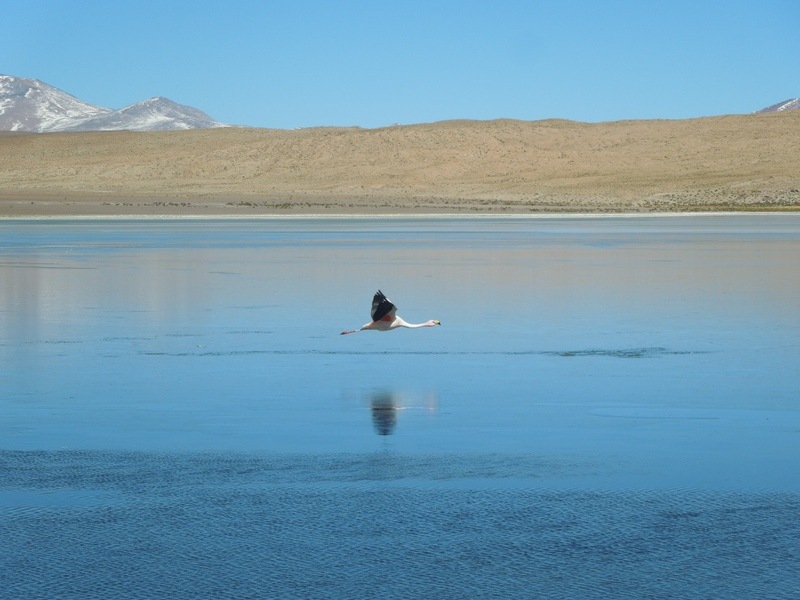 We lost our children on the second day, as they were heading back to Uyuni in one jeep while the other three of us were joined by a Bulgarian couple as we continued on to San Pedro de Atacama, across the border in Chile. 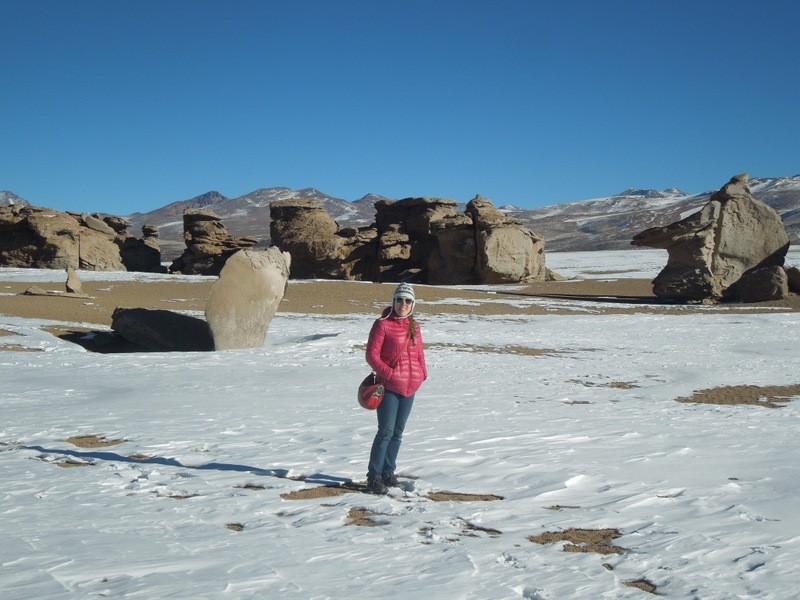 Day three, alas, we didn’t get to see the Laguna Verde or the geysers, or bathe in the hot springs, due to too much snow, and we also couldn’t cross via the usual pass. 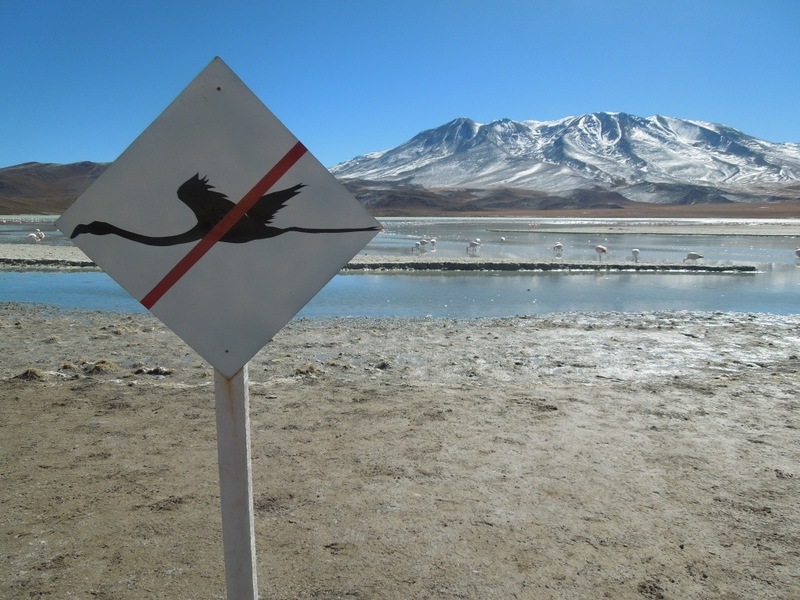 This meant a long detour and a (with hindsight) hilariously drawn-out journey across the border and into Chile. But more on that another time. 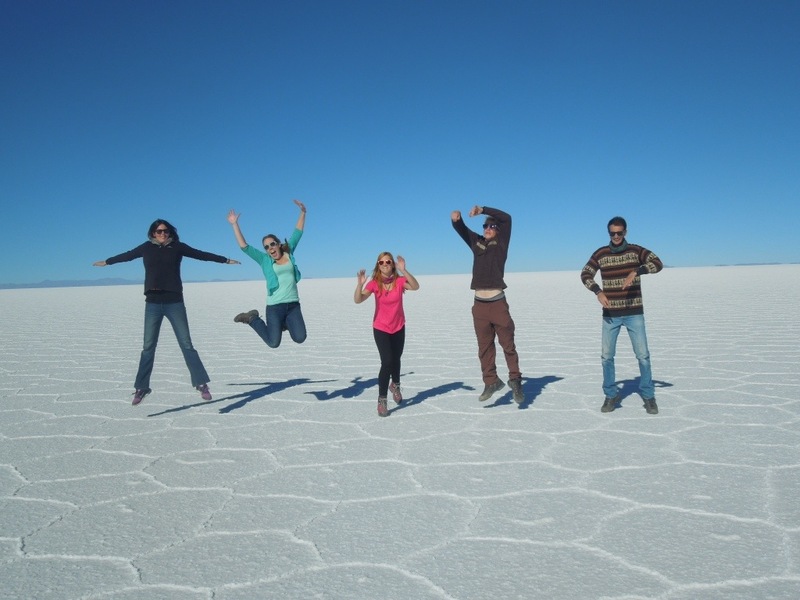 -Lonely Planet and online forums tell you not to book in advance but to do so only once you’ve arrived in Uyuni and talked to other travellers and met the agencies in person. This is all well and good but you may arrive to find that the tours for the next few days are full – so you need to have a buffer of a few days in that case, or to be willing to go with one of the other random agencies. -After much um-ing and ah-ing, I went with Red Planet Expeditions, recommended by a friend and receiving more or less positive reviews online. It was far from perfect – the guide wasn’t very clear in his explanations (the guide in the other jeep was much better); the food was, well, interesting; and on the third day, they woke us up early only to leave us hanging around for an hour and a half as they ate their breakfast at their leisure – BUT the driver wasn’t drunk, which I understand is a problem with many of these tours, and overall it was a good trip. 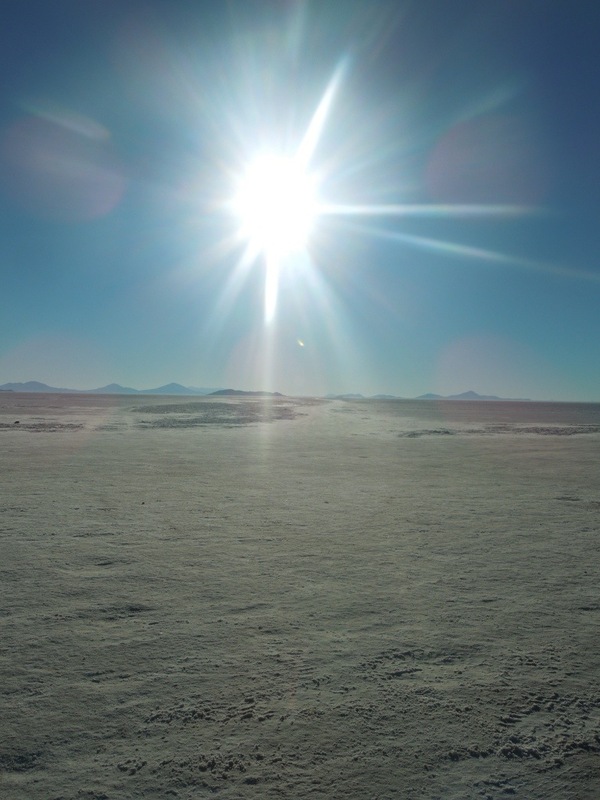 On the morning when I was leaving La Paz, the sun finally came out and it was actually quite warm. 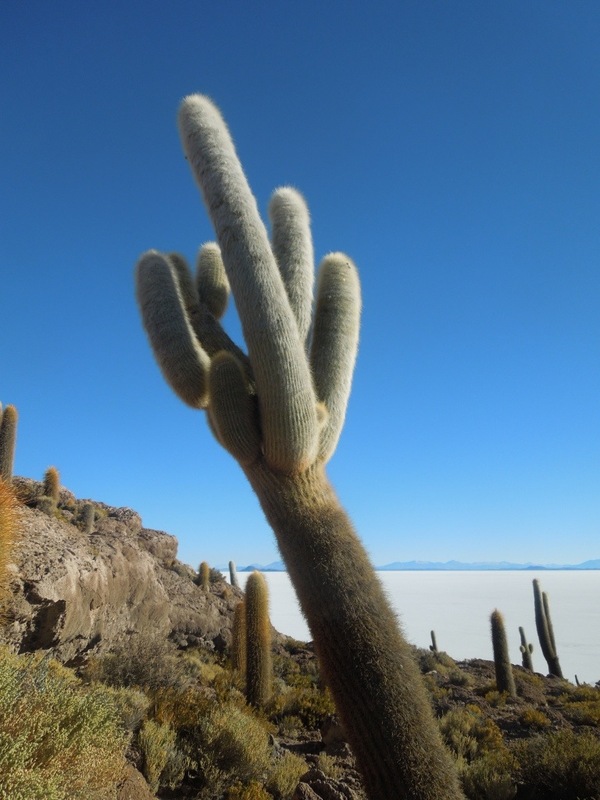 Muchas gracias, La Paz, you really didn’t want me to like you, did you? The highlight of my two days in the city was getting a free chocolate ball (okay, two) at the Café del Mundo, run by Swedish Elin – a nice little taste of home. And I also picked up an amulet at the witches’ market for good luck in work, travel and love; she added health for good measure but unfortunately that’s already fallen off. Oops. 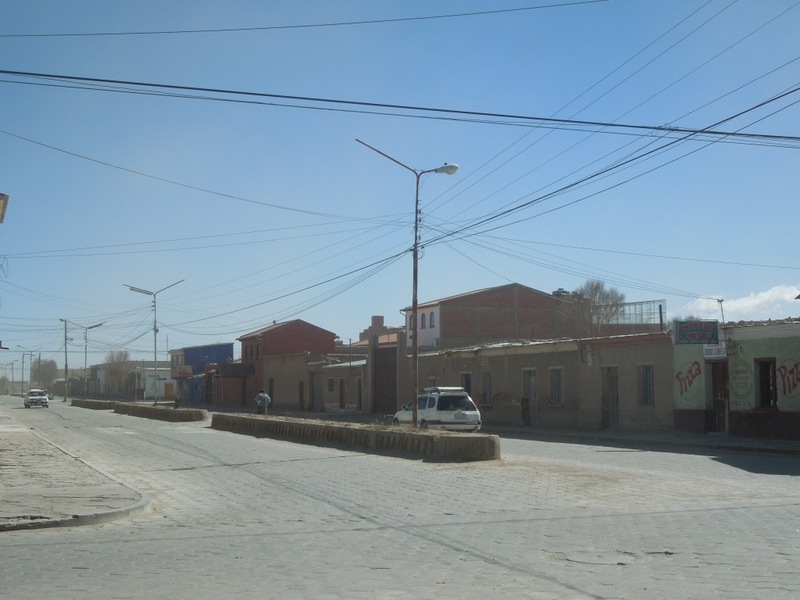 I turned up to the bus terminal at 9.55am and at 10am I was on a bus, heading to Oruro. In that sense, buses in South America are actually very efficient. I was glad I was on the warm bus as outside it grew colder. 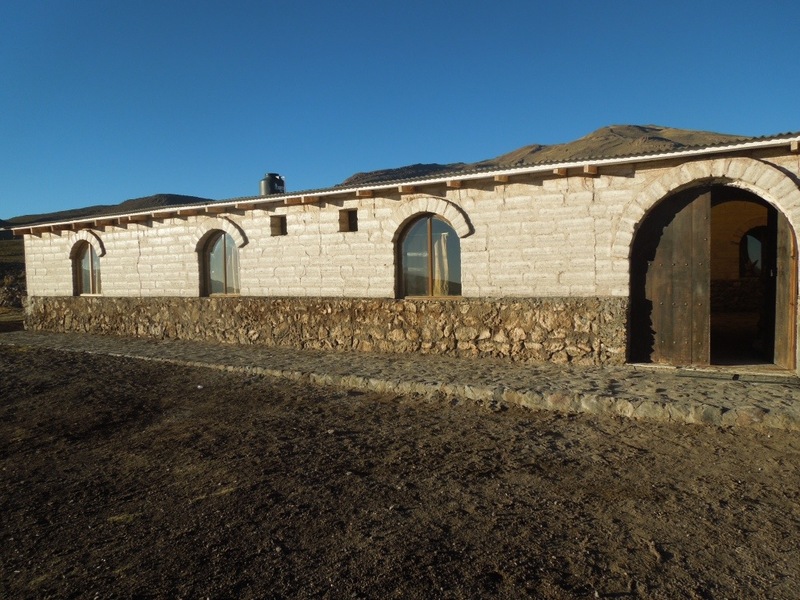 We passed houses made of adobe brick but with snow on their thatched roofs, quite a strange sight. Even more strange, on the other side, a castle with a turret and a rainbow slide. Random. At one point we stopped for a toilet break in the middle of nowhere – for men, of course, it’s no problem, they just face away from the bus; but the women managed to protect their modesty equally well, their long skirts hiding everything from view as they squatted right in front of the bus. I was wearing jeans. I stayed on board. 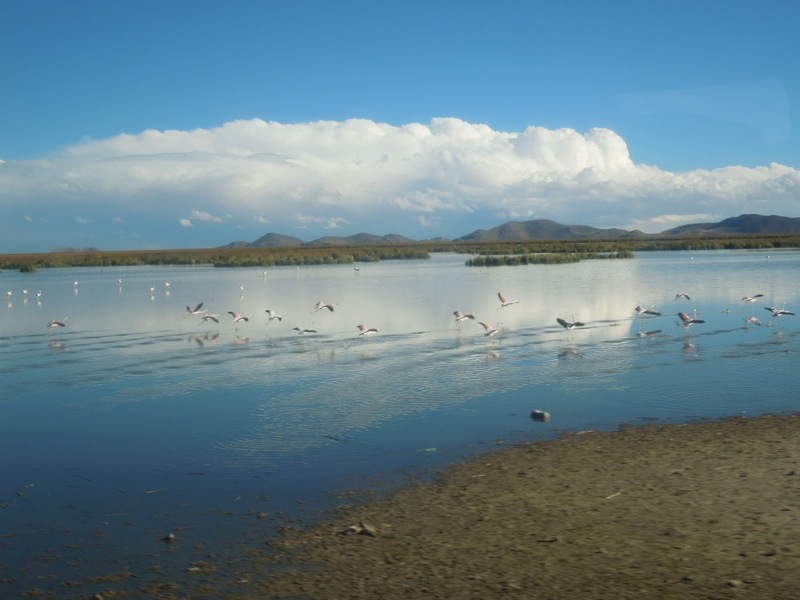 Outside, I could see flamingos on both sides, a double rainbow on the left (“Wow, double rainbow!”) and a golden sunset on the right. Then it was dark. 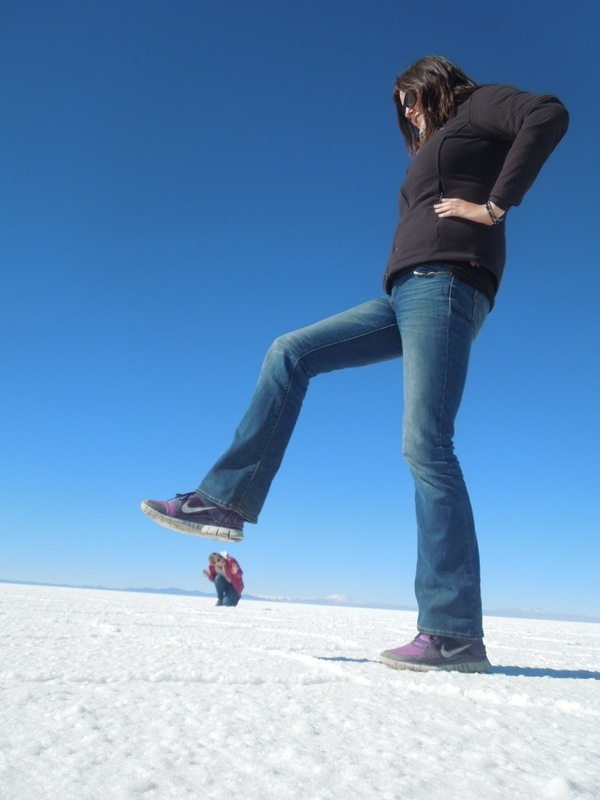 So, Uyuni: on my first day, it was quite warm and sunny, which was a nice change after grey and rainy La Paz. But it was incredibly windy, which soon caused problems in the form of a partial and then total power cut. What do you do in a city where there’s nothing to do when there is no electricity, the wifi not working in the hostel and Internet cafés in town not working either? I went for lunch in a dark restaurant and wandered aimlessly around town. There weren’t any cafés where I could sit with a nice latte either, darling. And without the electric showers, of course, were cold. 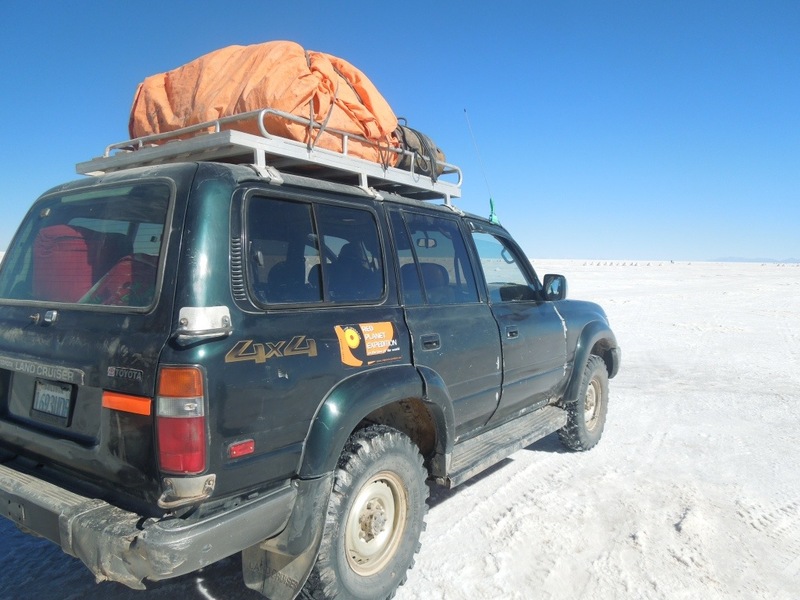 Uyuni seems to exist for tourists for one sole reason, which is to send us off on 4WD tours of the salt flats. And based on advice from Lonely Planet and online forums, I hadn’t booked the tour in advance and instead waited to talk to the agencies in person. Great idea, except that I found the good tour agencies were fully booked! Thankfully, my chosen agency took pity on me and somehow managed to fill a second jeep so I could head out the next day. Details of the tour itself next time! *For the record, Stonehenge is actually, like, in Wiltshire, which is, like, almost as far from Scotland as you can get. 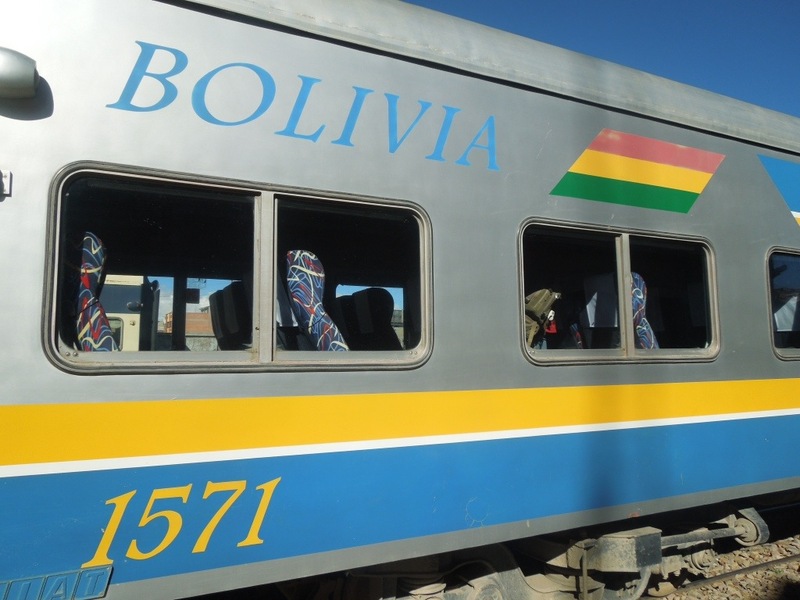 I managed to buy my train ticket already in La Paz; although I arrived at the office in the far end of town at 12.15 and they were closed for lunch 12-2.30pm. I waited with an Apfelstrudel and cappuccino in a nearby Austrian café, which wasn’t so bad. 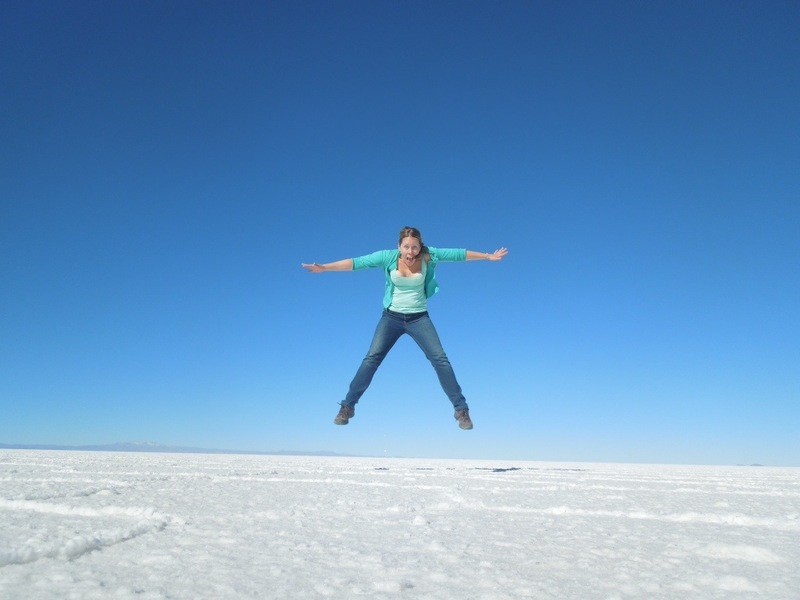 Uyuni looks quite nice in this picture, doesn’t it? 1) There is no heating. Anywhere. 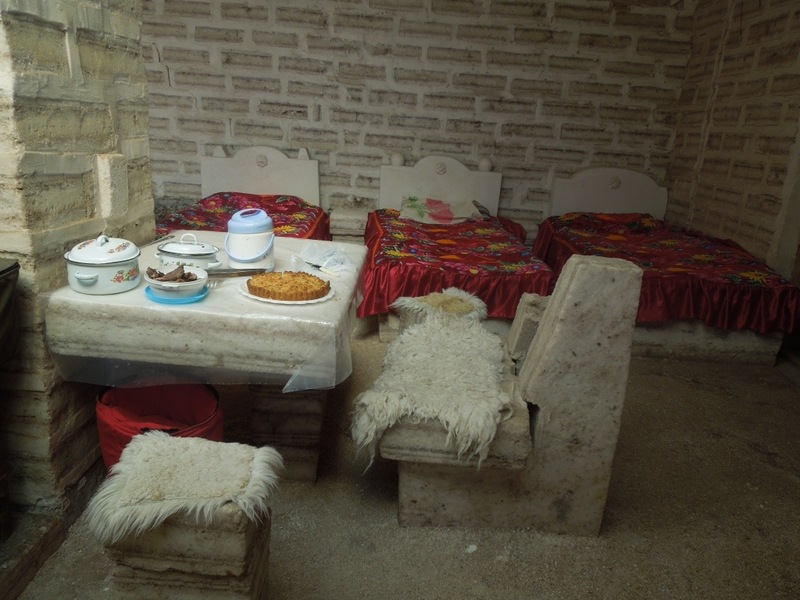 2) You can eat a four-course meal for 3 USD. 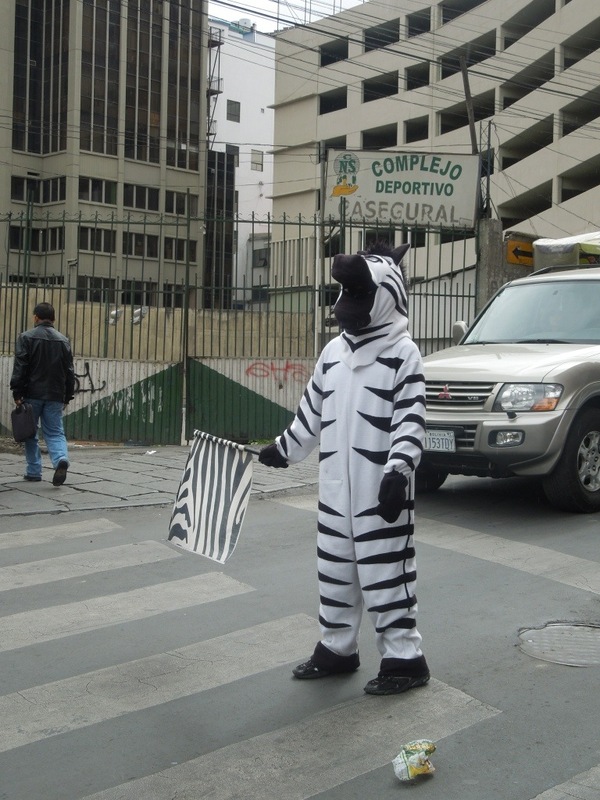 3) They have actual zebras on the zebra crossing. 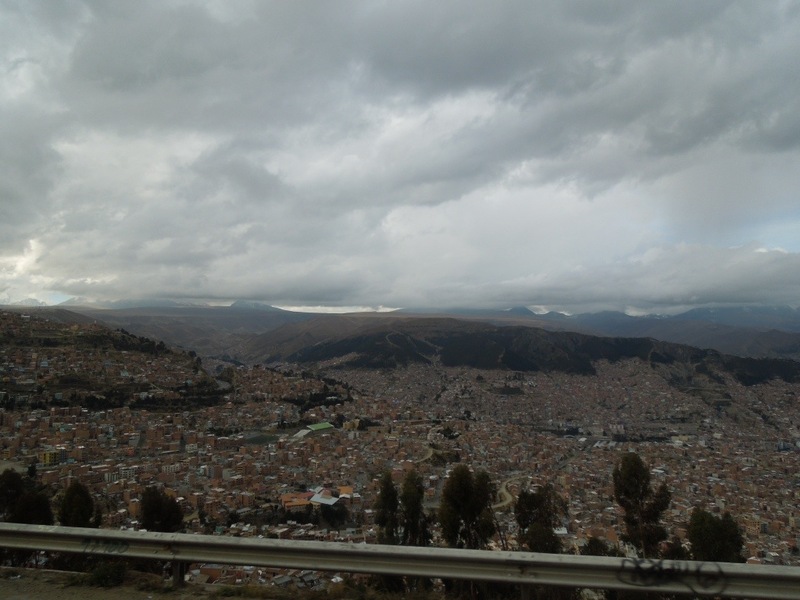 La Paz did not exactly show me its best side – it was very cold and wet, which made it super slippery on the steep cobbled streets and prevented me from doing any outdoor activities. But I did go to the Coca Museum. 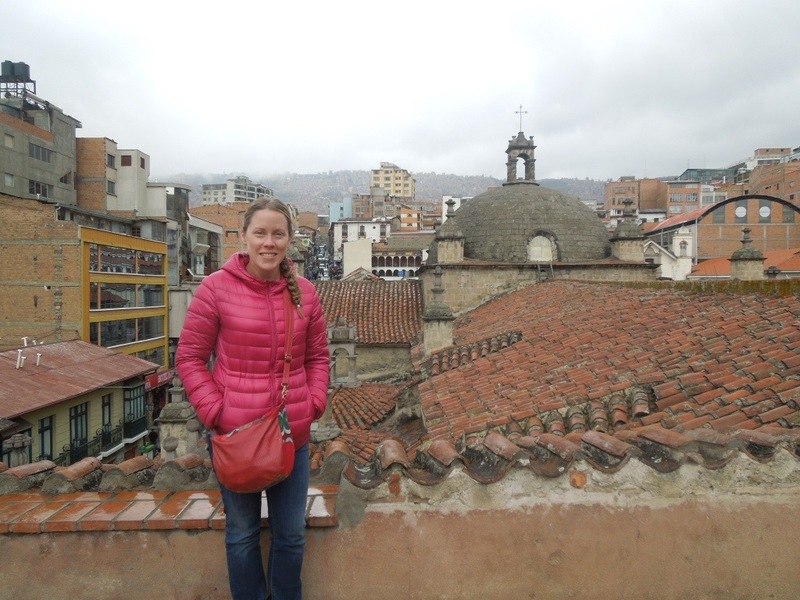 At high altitudes in particular, coca leaves are standard fare here. 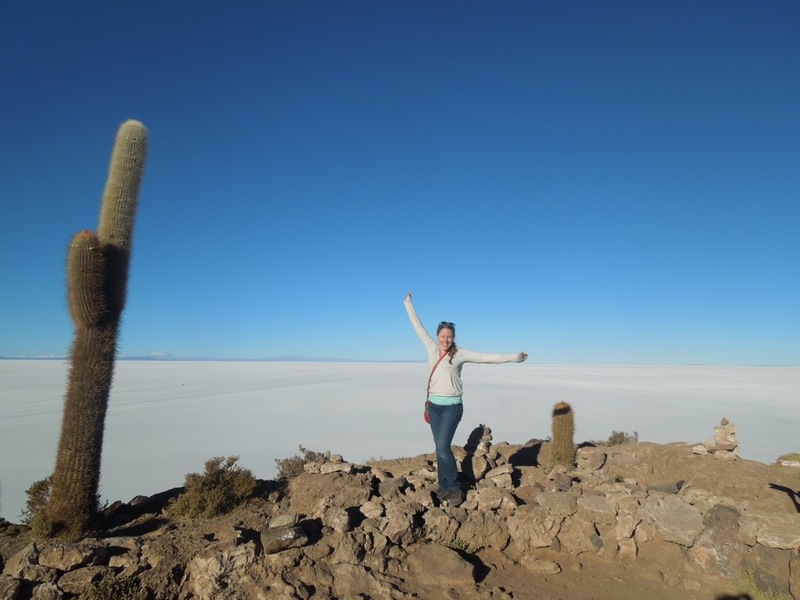 Locals will chew the leaves, as for example on both the Inca Trail in Peru and on the salt plains of Bolivia, where our guides carried a big bag from which they would pick leaves as you would crisps. 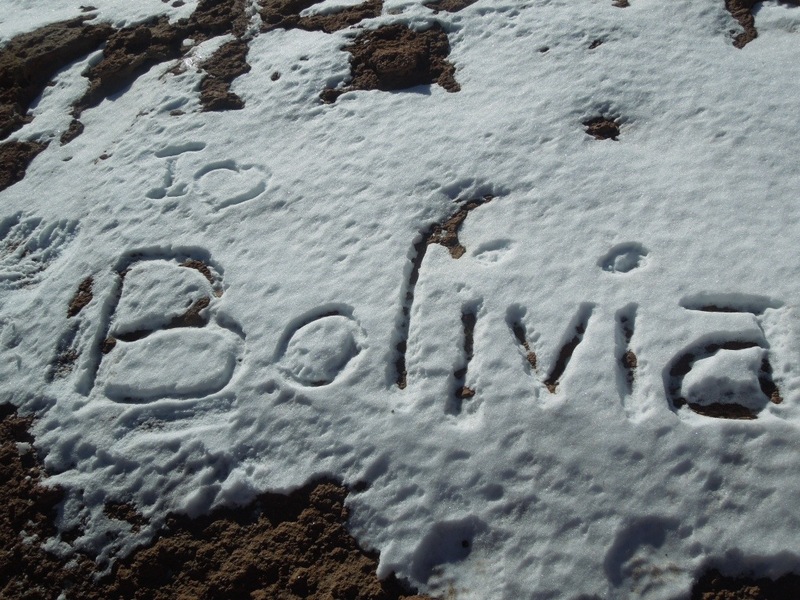 The first evidence of chewing coca leaves has been found in mummies from 2,500 BC. When the Spaniards came, the Catholic Church forbade the habit. But when they discovered how much more productive the miners would be with the effects of coca, they allowed it again, though subjecting it to a tax and restricting its distribution. 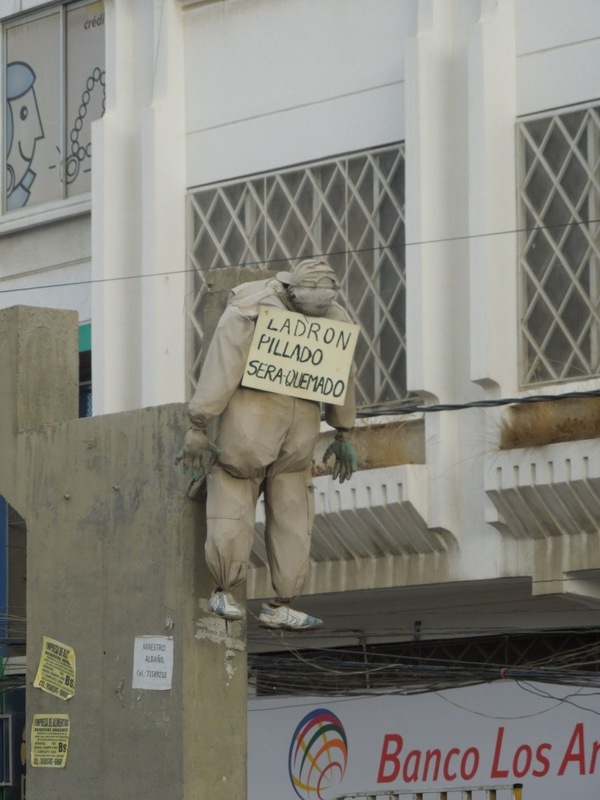 Experiments have shown that coca reduces the amount of oxygen that your body consumes, while it made the miners mentally more willing to go down into the mines, and able to work longer without feeling exhausted. 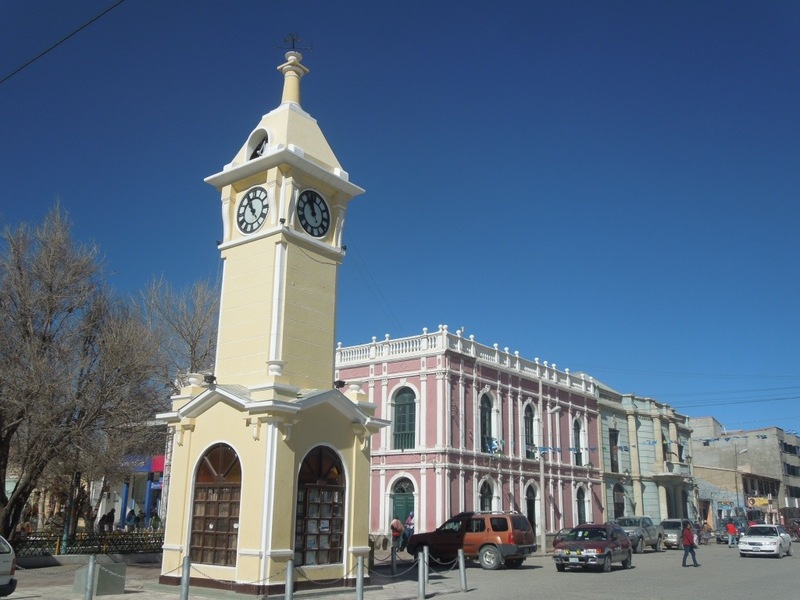 (Still today, boys in towns like Potosí, one of the highest cities in the world, will start working in the mines in their early teens, and rarely make it to middle age.) 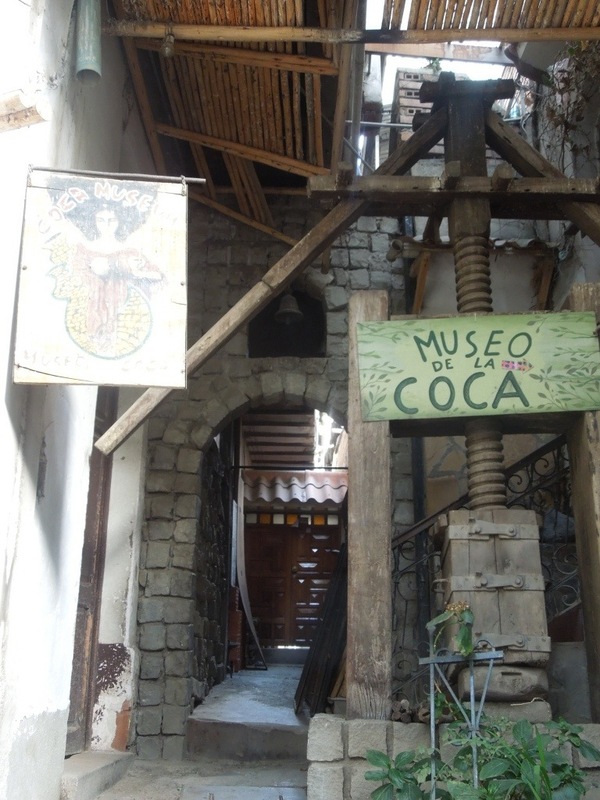 It was used commercially in the form of coca wine and various tonics, with posters advocating its stimulating effects and various health benefits. One of those products, of course, was Coca-Cola. These products became illegal when the addictive and apparently mentally retarding effects of cocaine were made public. 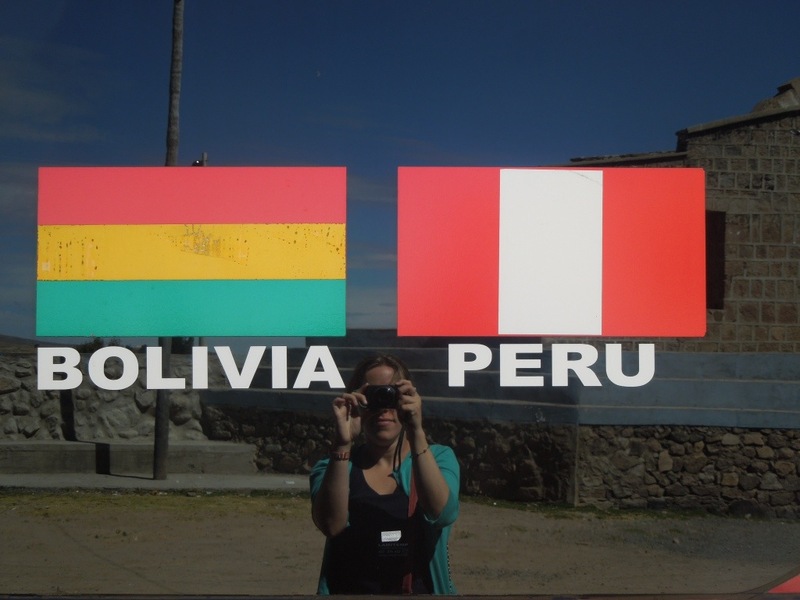 To cross the border from Peru into Bolivia, we needed to queue at two different places on the Peruvian side and then at a third place on the Bolivian side. 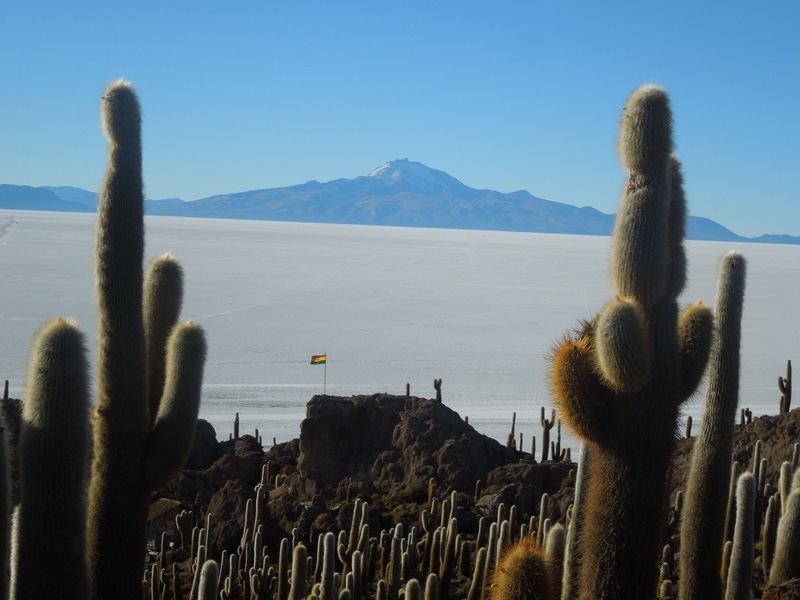 To enter this new country, we had to pay a tax of… one Boliviano (7 BOBs = 1 USD). Well worth the admin costs, I’m sure. In Copacabana, Lonely Planet recommends a “splurge” on Las Olas, an unusual hotel with cabins shaped like seashells and turtles. Unfortunately, this was already full when I emailed, but I got a room at neighbouring La Cupula, which had the same postcard views over the bay. I was joined by a Danish couple and an Italian guy who I’d met on the bus, and we had a nice relaxing lunch down by the lake. The town itself is small, with not a lot to do. 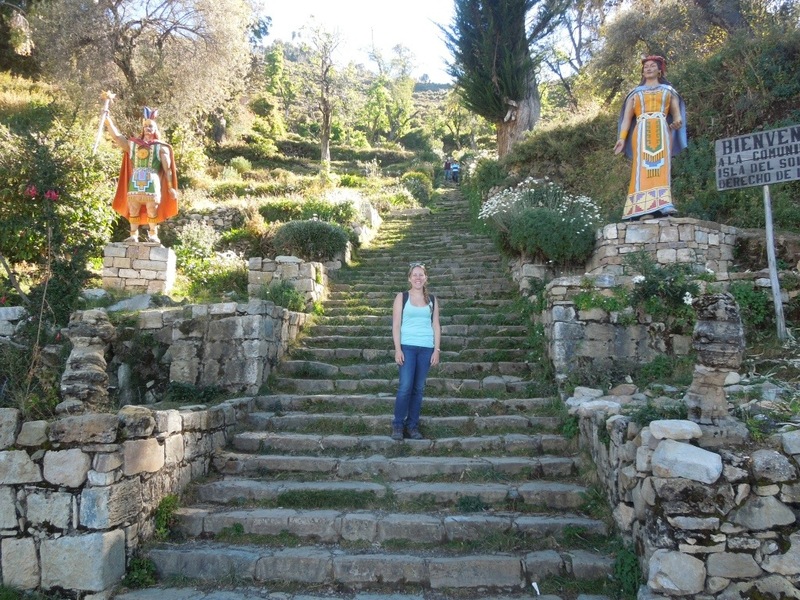 I followed the trail up to the Horca del Inca, supposedly an Incan astronomical observatory. 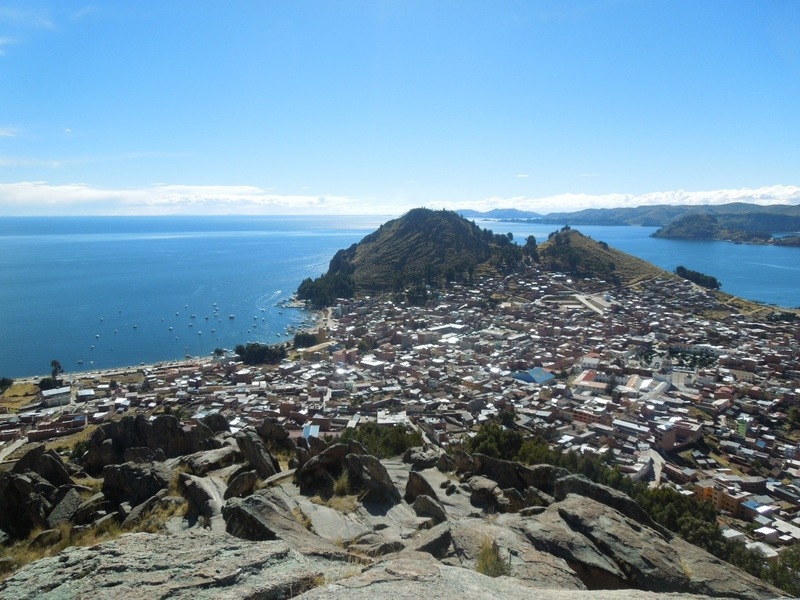 As with the deserted ruins I’d visited in Peru, I grew nervous as I climbed further and further away from the town and its people. At one point I saw a man sitting on a rock above, talking into his phone as he observed me, and I almost turned back; when I got to that same rock, he was gone. 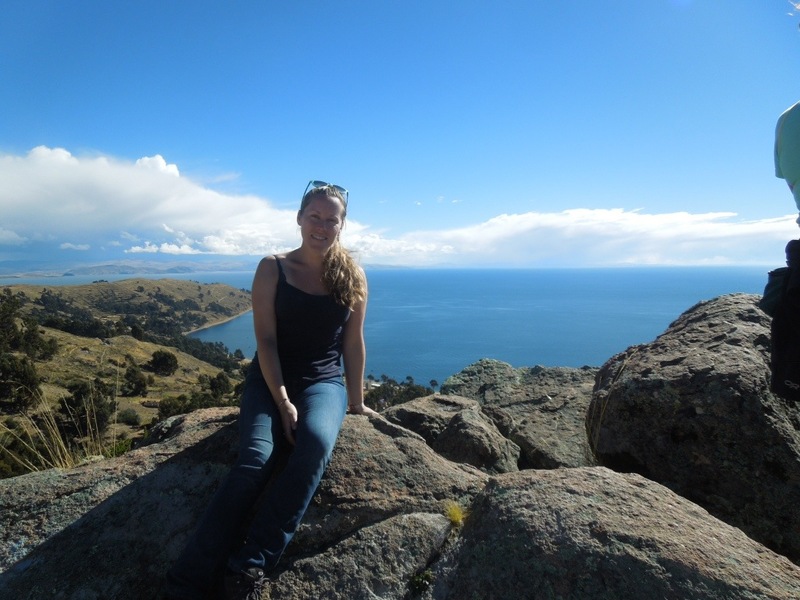 I climbed and climbed, and eventually got right up to the top, where I met a couple of Americans and Canadians. They told me I’d gone way past the observatory; but the views were fabulous, so I wasn’t sorry to have made the extra effort. On the way down, Jeff from Chicago (who in fact was living in Copacabana since two years, sponsored by the Methodist Church to build greenhouses for the local community) showed me the observatory. 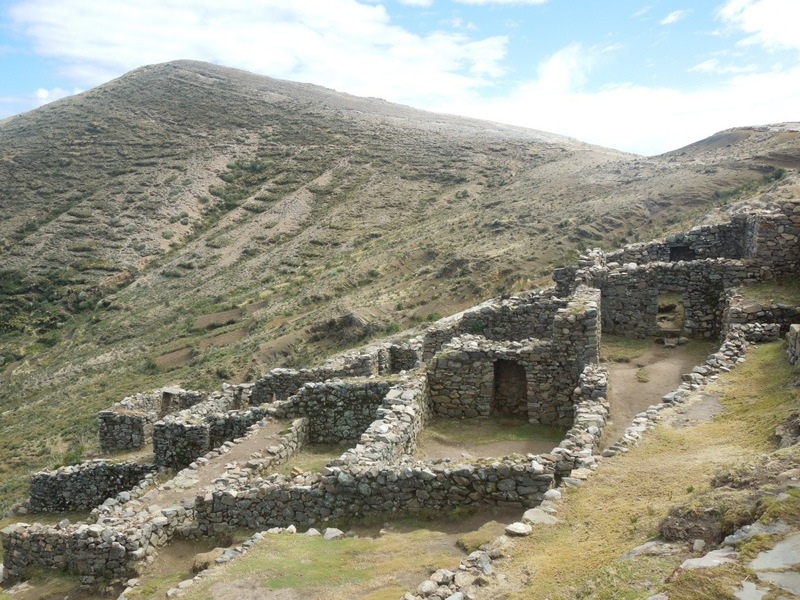 He explained that it was not actually Incan, but dated back to the 14th century BC. 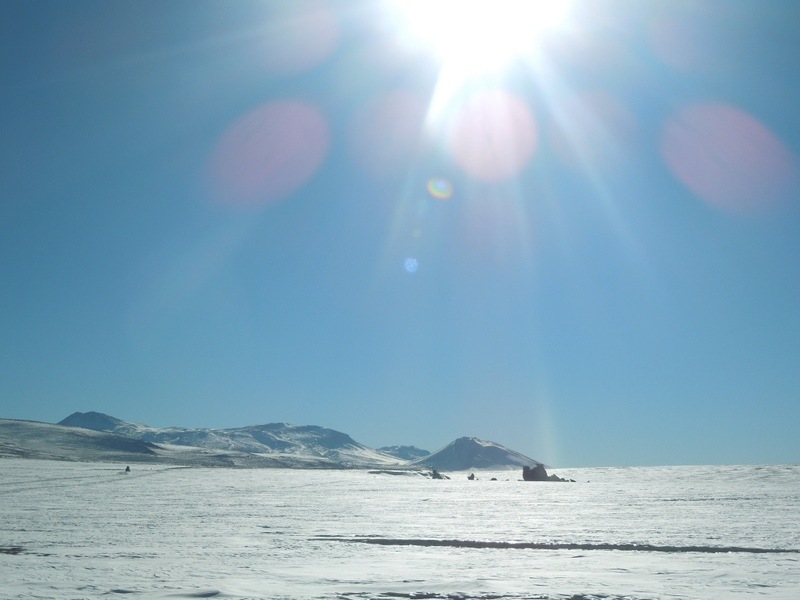 It consisted of a man-made ‘window’ through which the sun’s rays would shine and hit another rock on the winter solstice of 21st June. 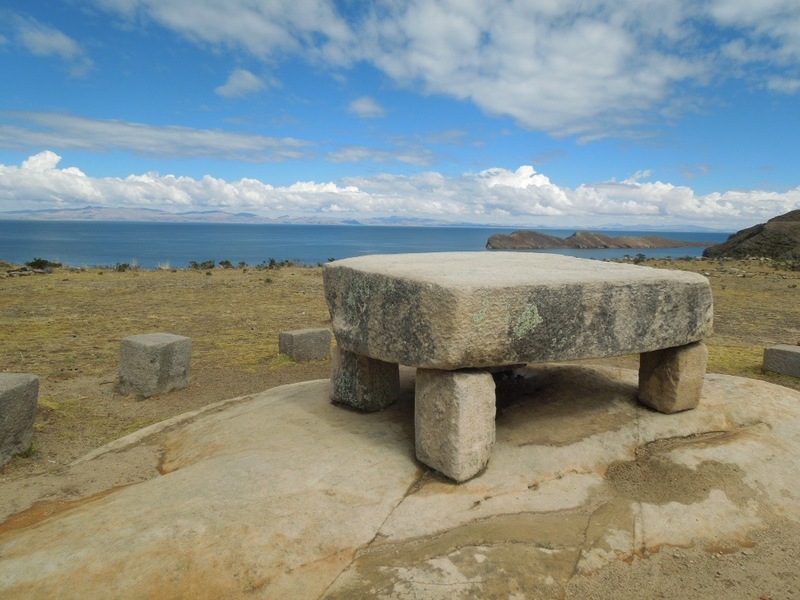 I decided on a day trip to Isla del Sol, said to have been the birthplace of the first Inca, Manco Cápac, who was the son of Inti, the sun god. It was a two-hour boat ride in the freezing cold and rain, but I had faith that the sky would clear, as it had done on the previous day. 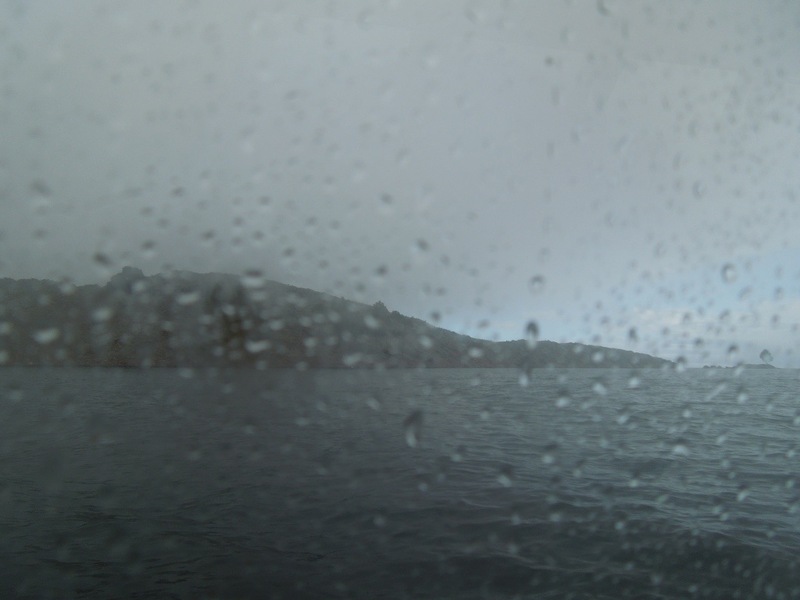 I fell asleep on the boat, to the dulcet tones of two attractive French men sitting opposite me, and when I woke up the sun had indeed emerged for our arrival to the island of the sun. The first place to visit was the Museo del Oro, a gold museum where I saw not an ounce of gold but just the usual bones and ceramics. 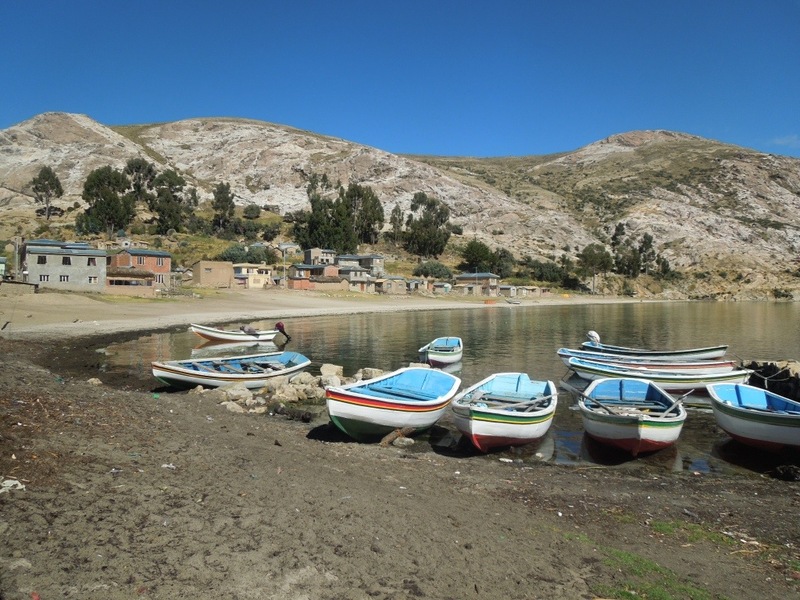 Next, along the beach and up to the archaeological sites of the north end of the island. Then you could take the boat down to the south end of the island but I opted to walk, stopping to eat my packed lunch from the hostel and to enjoy the views. 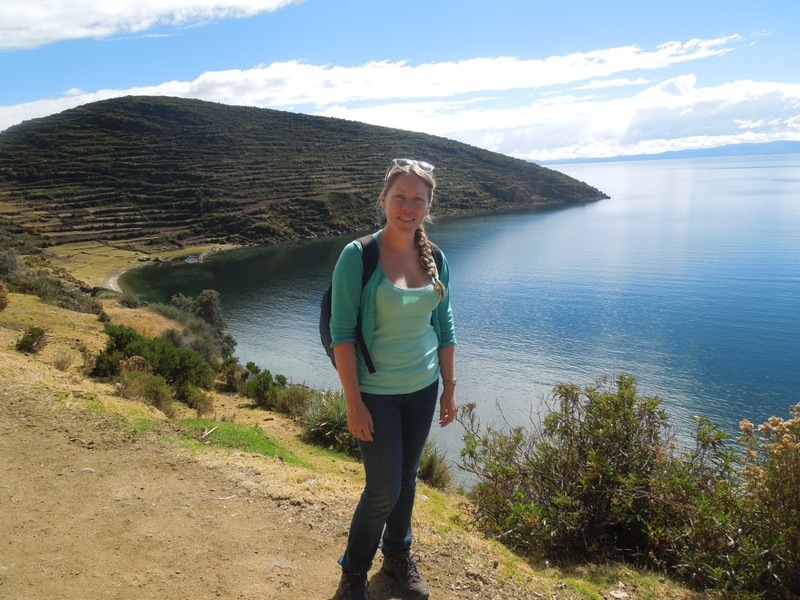 It was a three-hour walk with panoramic views over the lake and across to the mainland. Towards the end, I was joined by two local dogs who followed me all the way to the harbour. The next morning in Copacabana, it was raining. Time to leave. The bus ticket office very cleverly had a sparkling new double decker bus permanently stationed out in front, while the actual bus we would be taking to La Paz was smaller and rather more rundown. 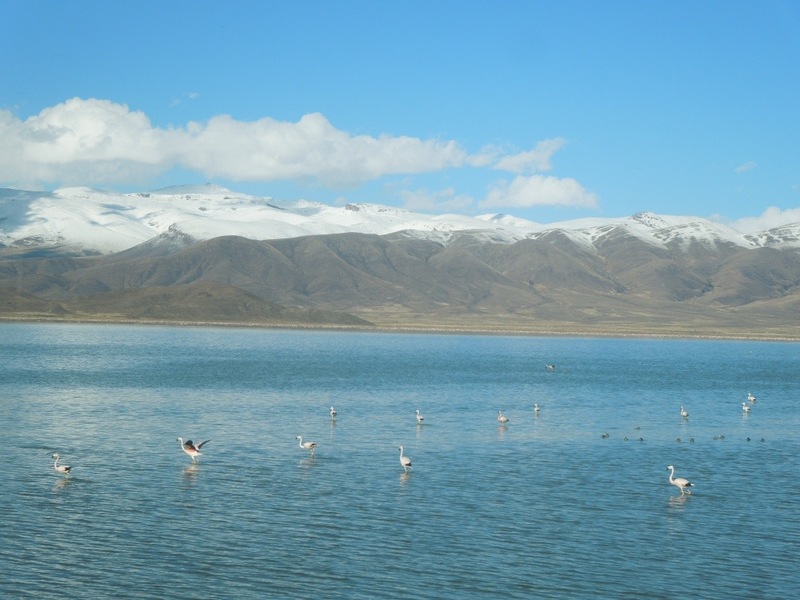 The views as we went along the lake were incredible. 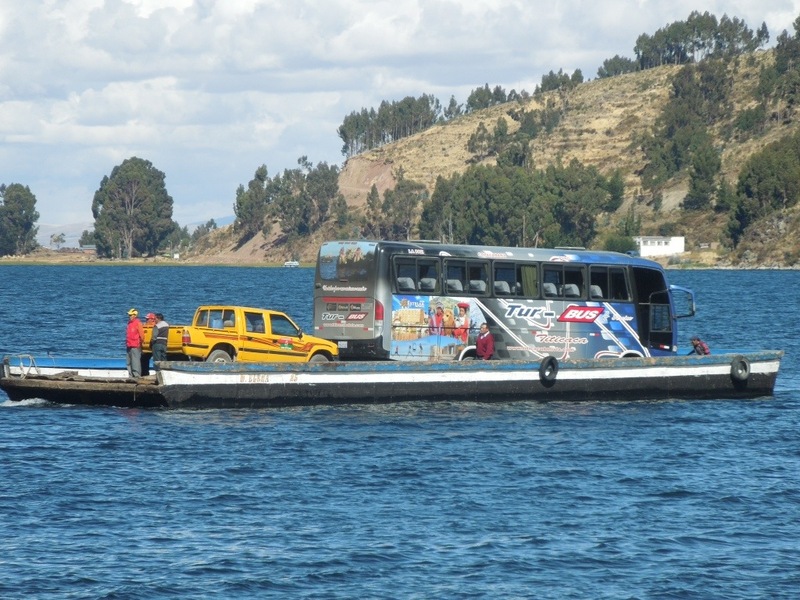 Also quite incredible was the experience of crossing the lake: the passengers went in a little boat, while the bus was shipped across on a raft. While I worried about my backpack that was still aboard the bus, we all made it safely across in one piece, and continued on to the capital. Would you want to be the driver on that bus?